Living color in full bloom! Every spring, we’re down on our hands and knees sowing the seeds that will bring color to your home, taste to your table and enjoyment to your family! At Huck Greenhouses, we grow annuals, perennials and vegetables for the best gardens in town. Our varieties are specially selected for the climate and soils of the Mid-Ohio Valley. Pick us for Fundraisers that Flower! If your organization is interested in raising money through plant sales, please contact us to plant the seeds for success! Choose the type of plant you want, size of pot you prefer and let us know what date you need them. Many schools and organizations have flower, herb, and garden plant sales in spring and mum promotions in fall. Proven successful in several local schools, Spring Plant Sales and Fall Mum Sales are excellent fundraisers at times when everyone is preparing for the colorful changes of our spring and fall seasons! Simply take your orders and we do the rest! 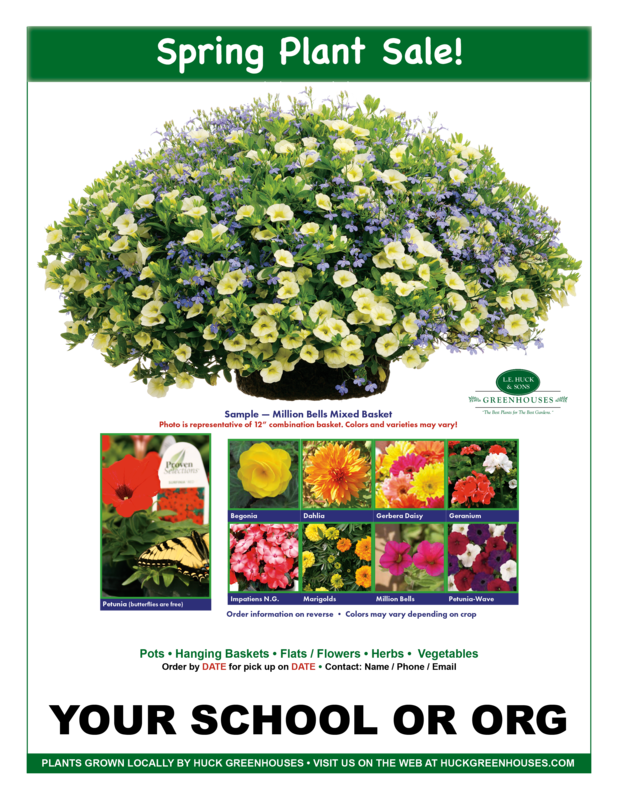 We make it easy by providing a flyer complete with order form customized for your sale, plus we deliver the plants to your distribution site. See sample flyer / order forms here. Hours vary during the season. Please follow us on Facebook for regular updates and special promotions. Proud to be a Proven Winners® grower! Contact us by early April for spring plant sales of flowers, vegetables and herbs. Contact us in August for fall mum sales!